Rebar Chairs are used to support the rebar mats or cages at the desired heights in order to achieve proper concrete coverage and thus maximizing the benefit of reinforcing steel. Chairs are typically made out of high density plastic which is both strong and light. Dura Chair - are the most commonly used in construction. they come in 3/4" to 10" heights and offer great strength allowing for a great deal of foot traffic on top of the rebar. Cross Chair - are only produced in 3/4" and 1" heights due to their design and relative low strength. they are also the lowest cost product available. Con-Chair - comes in 3/4" to 4" heights and has a flat base for sandy or unstable ground. They also clip to the rebar helping them stay in place. They are stronger than a Cross Chair but not quite as strong as a Dura Chair. To calculate how many chairs are required, take the square footage of the pad and divide by 16. Beam Bolster is used in applications where the spacing between the bars is very small and/or the cage is too heavy for a Dura Chair. 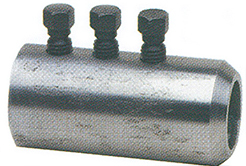 These are commonly used to support industrial-grade beam cages. They cost more that using Dura Chairs but installation time is significantly reduced. Bricks are used to support rebar mats in typical slabs such as driveways, sidewalks and light industrial buildings. They don't have a price advantage over chairs but offer a flat bottom for unstable ground and can support a large amount of weight. 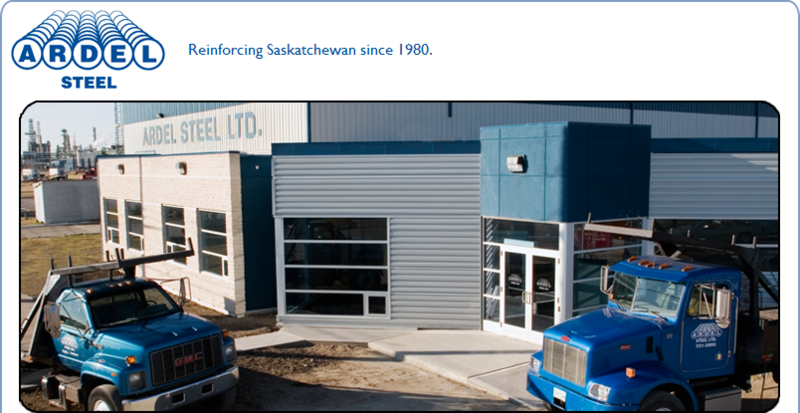 Ardel Steel keeps a large inventory on hand and will supply them in small or bulk (768 per pallet) quantities to meet your needs. Bricks are typically split in half so 1 brick provides 2 supports. Barlock couplers are a quick and easy way to splice rebar. 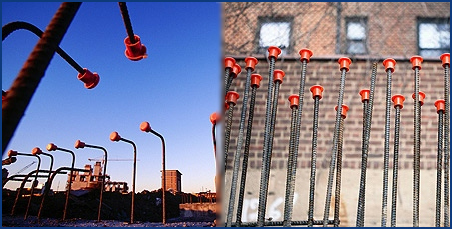 Barlocks exceed industry strength requirements for tension, compression and seismic loading. Typically barlocks are used in applications where a lap splice is not sufficient or not possible due to dimension constraints. 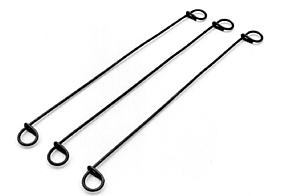 Ardel Steel stocks standard Barlocks in 15mm, 20mm, and 25mm sizes. Additional sizes and types are available upon request. Insert the first bar up to the center pin and tighten each bolt to a snug fit. 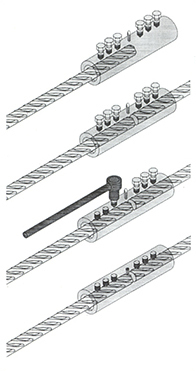 Check rebar alignment within the coupler. Tighten all the bolts in a random alternating pattern on each bar until the bolt heads shear off. Splice is now complete (pin removal is optional). 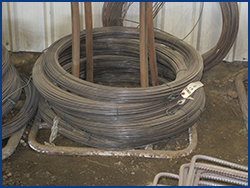 Tie Wire & Loopties are used to hold the rebar cages/mats in place while the concrete is poured. They don't add any strength to the final structure, but if used correctly are cheap insurance that the rebar remains at the correct spacing and clearances to provide maximum reinforcement. Tie wire comes in 3-1/4 lb. bare and poly-coated rolls and is used in conjunction with a tie wire reel. lengths are available via special order. 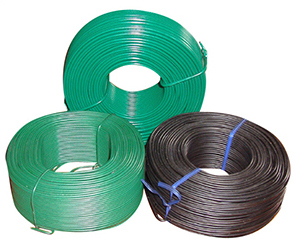 Gauge Wire is used in many applications ranging from fencing to bundling of heavy products. Ardel Steel stocks 9 gauge (1/8") and 12 gauge (3/32") in 50 lb. rolls.